David Maister just posted something very interesting: a question. "What are the top 10 bad habits partners within professional services firms display?" That's easy. They're not proactive. Steven Covey pointed out the importance of being proactive in his landmark book The Seven Habits of Highly Effective People. He listed proactivity first. He was right. Marketing and business development are, ultimately, all about creating a vision of the business you want to have, and then reaching out and doing what it takes to make that vision real. In my line of work, this means engaging with your market. It means calling people you don't already know, making presentations with no guarantee of success, and so on. It's about taking initiatives. Professionals are often very risk-averse people. They're used to solving complex problems within a bounded system. There are certain rules, and processes, and there isn't any model for trying something new, or even trying something at all. So they don't. 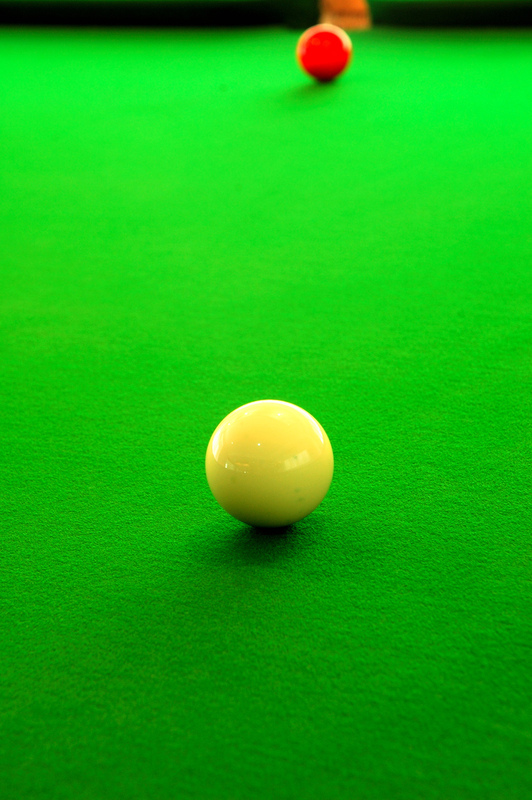 Or, to use a metaphor, they tend not to be the cue ball, but instead, the ball the cue ball is aimed at. This is fatal. If I could boil everything I know and teach down into one concept it would be: make something happen. Mr. Covey is right. Do something. My mother is a lawyer. I had a somewhat unusual upbringing. From the time I was little, she would occasionally quote Roscoe Pound, the famous jurist and Dean of Harvard Law School, who she said said:" "The law must be stable, and yet it cannot stand still." As I said, unusual upbringing. And Dean Pound's observation also applies to business development. In his blog In Search of Perfect Client Service, Patrick Lamb wrote an excellent post providing yet another reason for buisness development: change. Quoting Seth Godin, Lamb makes the point that there are two kinds of people in the world -- those who love change, and those who hate it. The latter group tends to shun business development. Just yesterday, I was talking with a marketing director at a firm here in San Francisco, who regularly battles with attorneys who literally tell her they don't want new business. Those are people who really dislike change, a lot. Which is fine, except that the world does not stand still. The market, the competition, your clients, the law itself, changes constantly. Your current clients may not exist in five years. A concrete example. This morning, I vaccummed the floors using a Dyson vacuum cleaner. This company, or at least the business unit that manufactured and sold vacuum cleaners, did not exist ten years ago. Now, they sell something like $700 million worth of vacuums annually. This is a new company, and I guarantee they retain a lot of attorneys. Someone got that business. And Dyson is not creating a new market -- they're taking market share away from, say, Electrolux. Hoover. And so on. The point is that by definition, lawyers have clients. The fortunes of the clients are always changing. The way lawyers adapt to that is by developing new business. If you don't, if you hate change, you're hating the inexorable. it's like hating the sunrise. One way or another, it is going to happen, and if you are not out in the market responding to change, if you resist or deny it, you are at its mercy. And that is not a good place to be. "Can you tell Terry what you told me?" Margaret asked. "All of it?" I could feel sweat saturating into armpit stains. I gave him a half-assed capsule summary of my rant. "There will always be a place in the market for good lawyers." Terry deadpanned back. "A good lawyer is a lawyer with business. Service Partners are indentured servants, and the clients get more savvy every day. The rates are going up, but the realization is going down. Clients are shopping by price; it's an actuarial game. We're going to be like accountants in 15 years." "That's a tad cynical, isn't it?" Terrance quipped. It was cynical. Law is a cynical business. The process of building, hiring, feeding and wringing profits out of young lawyers is among the most craven systems ever invented. First you seek people who behave like computers. You want talent, but you want it in a limited form. A single 150 IQ with an endless reservoir of Protestant Work Ethic beats a half dozen courtroom prodigies every day. You want a hungry, bright Believer who'll work like a dog and consciously avoid asking all the questions that would drive a seer to leave... Drones with the Oedipus gene bred out of them - the sort who'd never have the balls to steal clients and start their own firm. You need kids who know nothing about the business of law and don't see past what looks like the biggest salary anyone under 30 could have. If you manage this human capital the right way, over their eight year career at your firm, you get 16,000 billable hours out of an associate. At an average rate of $300.00 per hour, that's enough to buy the biggest ego a swell beach house. These kids will bill nights and weekends and lose their minds when you give them that $15,000.00 Christmas bonus. If they want prestige, you can give them a title like "Member" or "Non-Equity Partner." This will stall a few from asking about being made an actual partner for a few years. "Partner" is for closers, and closers have business. The ones that don't like being capped in the "non-equity" or "member" pools will leave. They'll join boutique firms, but you don't have to worry about them stealing business. If you've kept them in the office enough over the years, they won't have that skill."